Former Hatters boss John Still believed he would have been able to turn Luton’s fortunes around this season had he been given more time by the club. The 65-year-old was relieved of his duties by the board at Kenilworth Road after a 4-3 defeat to Northampton Town back in December, as Town’s fourth successive reverse saw them drop to 17th in the table. But although Still accepted improvements were needed, he remained confident successful season was in his capabilities as speaking exclusively to the News/Gazette, he said: “I thought so, I know others might not have done, but I thought it needed tweaking, which we would have done. “We were scoring plenty of goals, but we conceded, they’re not scoring as many goals here now, but it’s just my own personal belief, I would have found a way. “The two full years here, promotion and eighth, I was delighted, I really was. “It wasn’t going quite so well when I left, but that’s football, the club decided it was time for me to go on, that’s football as well. “I don’t worry about that, it doesn’t concern me, because as I always say, I have a way of doing it, I’m not ever going to change, I don’t care what anyone says, I’m never going to change because I love the way I do it and I love doing it. “It’s been successful so why would I change? But the club thought it was time to change, no problem with that. Still was eventually replaced by Nathan Jones and on his appointment, the ex-boss said: “Good luck to Nathan, I like Nathan, he’s a good guy, a hard-working guy, conscientious guy. 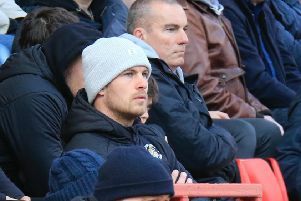 Still made his first return to Kenilworth Road on Tuesday evening when he brought his Dagenham & Redbridge side back for a 1-0 defeat that all but confirmed their relegation to the Conference. However, the boss was afford a superb reception by home supporters before, during and after the game, as he said: “It was really good, I’m really pleased and I know it sounds silly but I didn’t even give it a thought, I came here for the game, but it was very nice, really nice. “I had nearly three years here, had a great time, and I hope whoever taken the reins now takes them on again. “I spoke to John pretty much as soon as he got the job, he fully deserved the reception. “Me and John had a cup of tea before the game, it’s good to speak to him, he’s a good man, did well for the club, and he’s done well for Dagenham.